I have been working with Foo since April of this year. I am actually one of the people responsible for Paula purchasing her as her next endurance prospect, along with her daughter Kathleen. Foo is not actually her registered name, but as we were leaving after looking at her, none of us could remember her name. And she had a lot of foofy hair. It was shorter then and all over the place, so Paula dubed her the Foo. She was already well ahead of the game from Quick. 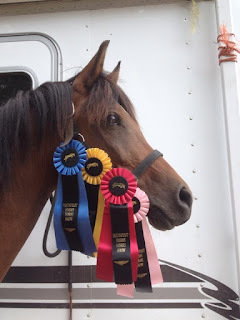 She had just returned to her breeder and had been in show reining training for a short period of time. She was safe and had three gaits. Did I ever mention that Quick could not canter? It was more of two drunks in a horse suit, legs everywhere. Foo had some setbacks, probably a couple bouts of ulcers. She would also get angry, and seemly stuck in this angry state. She also started losing her mind, she was just reacting. All the while she was still really safe, no spook none of the issues that Quick had that made him dangerous. Everything was coming to a head with Foo, it seemed as if this downward spiral was out of control. But I always had the feeling that this was the right horse, I just questioned if I could pull her out of where she was.